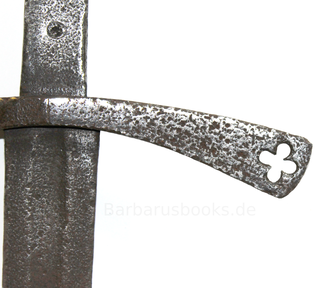 Shown is a sword from 1300 to 1450 with a slender double-edged blade with fuller on both sides. 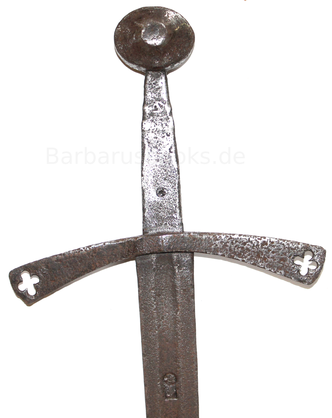 The square guard with conically widened arms is rounded and open at each end with a cross shape. The tang is conical and ends in a disk knob. This sword was only intended for one-handed use and was carried by nobility. Detail of the openwork cross-shaped guard. Front view: Sword with disc knob and punch on the fuller. 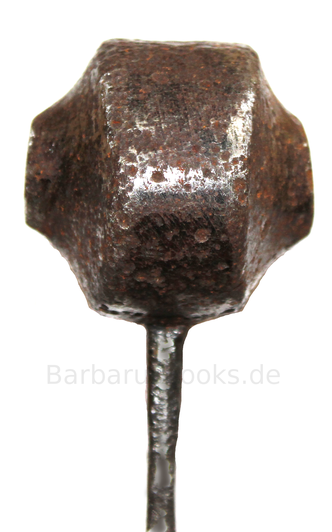 Side view of the rivet knob with conical tang.